Our new grants will go to support the Initiative Sankofa D’Afrique De L’Ouest (ISDAO), a new regional grantmaker, and to Synergia. We are pleased to announce our first grants in West Africa for LBQ women and trans communities. Our International Development programme began to focus on LGBTI civil society in sub-Saharan Africa three years ago and has a particular focus on LBQ women and trans people. Until now, the programme has largely focused on civil society in East and Southern Africa through our support to two expert regional grantmakers, UHAI EASHRI in East Africa and The Other Foundation in southern Africa. However, civil society activity has been slower and more challenging in West Africa and is heavily restricted. This situation is particularly acute for LBQ women and trans people – very few groups have been identified as working for these communities. Our new grants will go to support the development of a new regional grantmaker for anglophone and francophone West Africa – Initiative Sankofa D’Afrique De L’Ouest (ISDAO) and to support Synergia, which will offer capacity building and financial support to emerging LBT groups in francophone West Africa. 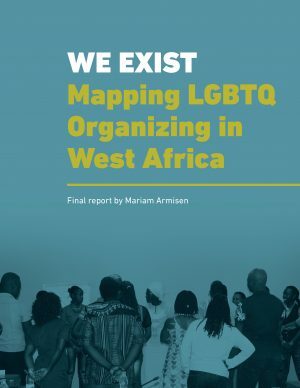 For more information about civil society organising for LGBTQ communities in West Africa, this report (We Exist) provides an excellent overview.